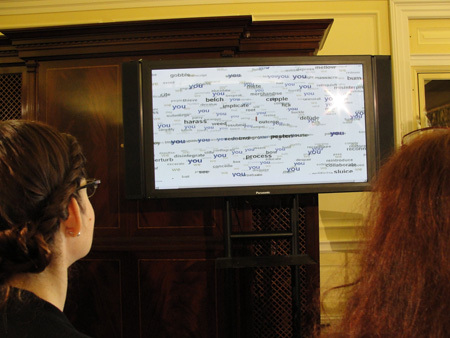 Electronic Literature Showcase at the Library of Congress (April 3-5, 2013). 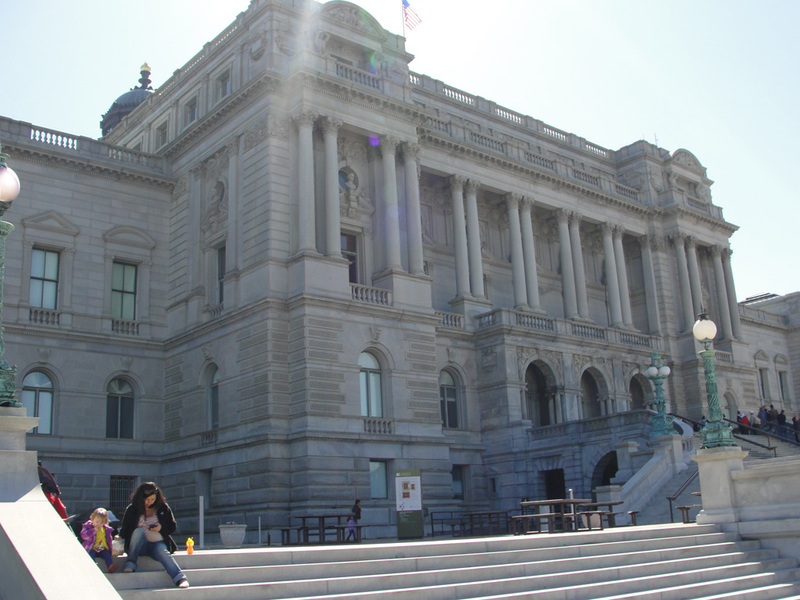 Getting into the Library of Congress is no easy task. On Friday, April 5, 2013, I found myself in line on the steps of the Thomas Jefferson Building, where I waited for about ten minutes to gain entry to the nicely modeled Italian Renaissance foyer. My line mates and I shuffled forward and strained to make out the barks of the security officer, confirming among ourselves that she had indeed ordered us to remove spare change from our pockets, watches from our wrists, and yes, even belts from our waists to get through the security screening as quickly as possible. Standing outside of this building with our pants sagging and our fists full of nickels and dimes, we could all tell that this was not a quick trip to the local library for the latest Grisham thriller. This is where the greats are kept, where the contents of Abraham Lincoln's pockets on the night that he was assassinated share space with Alexis de Tocqueville's De la Démocratie en Amérique and where The Gutenberg Bible is housed alongside the library's oldest comic book, Popular Comics (February 1936). This place preserves American heritage and adds to its prestige. And, for the first time ever, this was the home of an exhibit devoted entirely to electronic literature and its predecessors. For e-lit scholars and artists who have struggled for the past twenty years to answer that often-asked question, "So...what exactly do you mean by 'electronic literature? '", the confluence of this moment, this exhibit, and this place was akin to a somewhat geeked-out version of the Superbowl, complete with rare vintage books, early and modern computers, manual and electric typewriters, and digital exhibits projected onto walls and audience members' bodies. In short, this was the making of history. In arranging this exhibit, Drs. Dene Grigar and Kathi Inman Berens, guest curators for the Electronic Literature Showcase at the Library of Congress, may very well have changed what it means to study electronic literature in America. Dr. Susan Garfinkel, acting as the host at the Library, participated in the curation of books & in procuring several items used throughout the exhibit. This interactive exhibit, held over the span of three days (April 3-5, 2013), invited the general public, as well as members of the electronic literature and digital humanities communities, to view, create, read, play with, and immerse themselves in various historical and contemporary works of electronic literature, many displayed on their original digital machines. 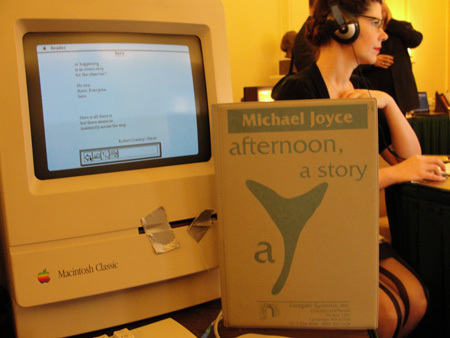 The exhibition featured five "Electronic Literature Stations." Each station contained pieces that loosely applied to a different generic theme organized in a generally chronological order, although some newer pieces also appeared at nearly every station. The twenty-seven works showcased, all by American authors, represented a broad scope of what American electronic literature is, but, by necessity, could not represent the entirety of the form. Station #1 featured different styles of electronic poetry, while Station #2 showcased works such as the classic "canonical" hypertexts afternoon: a story (Michael Joyce, 1990) and Victory Garden (Stuart Moulthrop, 1991), among others. 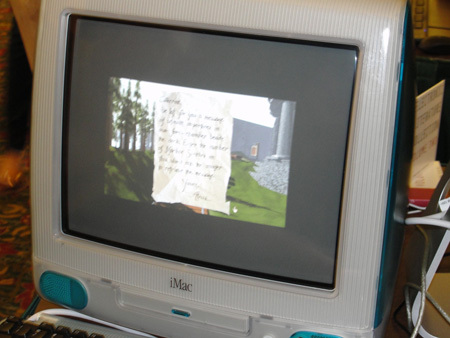 At Station #3, the audience was able to interact with several pieces that blur the line between digital literature and computer games. Station #4 included examples of the numerous forms of narrative that electronic literature can take and Station #5 focused on the various types of art inherent to the field. In addition to these five stations, the exhibit featured a rare book display including traditional codex-based texts that many regard as precursors of the trends emerging in digital media, as well as various "creation stations." Books on display ranged from the 1529 volume of Geoffroy Tory's Champ Flevry to three of Werner Pfeiffer's 2012 art books, Hocus Pocus, Zig Zag, and ZiPo. The creation stations, meanwhile, allowed patrons to "get their hands dirty" creating their own non-traditional literary pieces. Perhaps what was most impressive about this exhibit, aside from the breadth and depth of the collection, was the freedom with which visitors were able to "play" with each piece. As I sat in front of the celebrated first-person game Myst (1993), Jason Lee, a student docent from Washington State University Vancouver, quickly came over to guide me through the piece. Lee first introduced me to the work, explaining what it was in a way that was approachable for either a digital scholar or a general visitor to the exhibit, and then helped me to navigate through a short segment of the text. Having never experienced Myst in its original form, my first reaction was that this exhibit is a great example of how works of electronic literature, much more so than other media, so strikingly carry the hallmarks of their creation dates with them — after all, twenty years is a lifetime when considering digital artifacts, and Myst looks, well, twenty years old. As I struggled to move through the computer-simulated world in order to enter the next segment of the work, Lee leaned over to tell me, in a conspiratorial whisper, that the adolescent boy who had visited yesterday had been the best "reader" of the work by far, and was one of the only people able to move from start to finish without so much as a hiccup. Clearly, just because Myst had the look of a piece that came of age around the same time that I did, it did not mean that I would be any better able to navigate it than the "digital native" who had preceded me at this exhibit. Looking around the room, I saw one couple with headphones on investigating Megan Sapnar Ankerson and Ingrid Ankerson's electronic poem "Cruising"(2001) and another guest intently reading Joyce's famous afternoon, displayed on an historical machine appropriate to its publication date. I saw a young girl pulling her mother over to a creation station in which she was able to use yarn and ribbon to affix bits of texts (lexia) together and assemble her own literary creation, in a sort of analog equivalent to digital hypertext works. As I continued through the exhibit, I found myself drawn to another creation station where guests could type their own concrete poems on a manual typewriter. While I was not the youngest person at the exhibit, I was surprised to realize that I had never before typed on a manual machine. 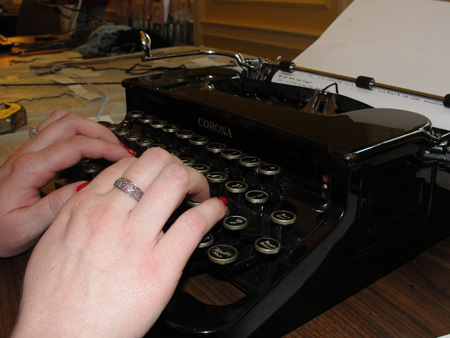 My first line of poetry did not appear at all, and after briefly wondering if the ribbon was out of pigment, I realized my mistake — I had to push the keys harder. Lesson learned: the medium really is the message after all. Individually, these vignettes might mean little to the future of electronic literature and the potential for the growth of digital scholarship and artistry outside of small pockets of avant-garde collectives. This has been the case for many years, as like-minded authors, programmers, artists, designers and scholars have had to carve their own tiny niches in English and arts programs, or to find their own way in programs even further afield than those traditional cousins to electronic literature. Yet this exhibit stands as evidence that electronic literature is no longer just a fad, or something that authors and scholars do "on the side" of their real jobs. Looking around the faces gathered in the Whittall Pavillion that Friday, I could feel a real, palpable energy surrounding that work that has already been made and celebrated for the past thirty years (and more), and that which has yet to be created. As Berens writes in her curatorial statement , "If this Exhibit historicizes the computer as a cherished if unreliable partner to e-lit artists, it also sheds light on what kind of e-literature endures." Certainly, the exhibit does just that, as it commingles print and digital; hands-on and computer-generated; and even text-centric narratives with pieces of literature that contain very few fully formed sentences. It acts as, not quite a substitute for, but an addition to the traditional system of cataloguing print and other media forms that we so often find in library and archiving systems. This exhibit extends the effort to talk about, experience, and investigate these often intangible works in ways that are meaningful and reproducible, one of the very real problems currently facing the field. It establishes that electronic literature will continue to thrive and to evolve. And, in presenting this exhibit at the Library of Congress, Grigar and Berens have made great strides in reasserting that this form is noteworthy, important, and deserving of our continued scholarly and belletristic attention. Grigar's post-exhibit report of the show notes that 755 visitors toured the exhibit in person, while 4,058 visitors from around the world clicked through the associated electronic archive in the span of twenty-four days. These numbers are not insignificant. This exhibit helps to strengthen electronic literature's status as a form that can continue to be appreciated, practiced, and read by an ever-widening audience. It validates the various genres emerging from this field and helps to answer that ubiquitous question of just "what exactly is electronic literature?" by continuing to spread its influence and acknowledge its impact in the Library of Congress, one of the most influential American libraries. Berens, Kathi Inman. "The Catalog and the Ephemeral." E-Literature At the Library of Congress. Library of Congress. 2013. «http://kathiiberens.com/2013/03/26/loc-curatorial/» (accessed June 19, 2013). Grigar, Dene. "Impact Report." E-Literature At the Library of Congress. 2013. «http://dtc-wsuv.org/elit/impact-report.pdf» (accessed June 19, 2013). Berens, Kathi Inman, and Dene Grigar. Electronic Literature & Its Emerging Forms. 2013. «http://dtc-wsuv.org/elit/elit-loc/» (accessed June 19, 2013). Jennifer S. Roudabush received her doctoral degree in Media, Art, & Text from Virginia Commonwealth University, and currently works at Virginia Commonwealth University in the University College. Her research interests include digital humanities, electronic/new media literature, narrative theory and dynamics, and rhetoric and composition.